An essential part of the responsive classroom. If you’re new to teaching writing, you may have heard discussion about writing workshop but not be entirely sure about what it is or how to use it in your classroom. WeAreTeachers is here with the answer. Writing workshop is a student-centered framework for teaching writing that is based on the idea that students learn to write best when they write frequently, for extended periods of time, on topics of their own choosing. To develop skills as a writer, students need three things: ownership of their own writing, guidance from an experienced writer, and support from a community of fellow learners. 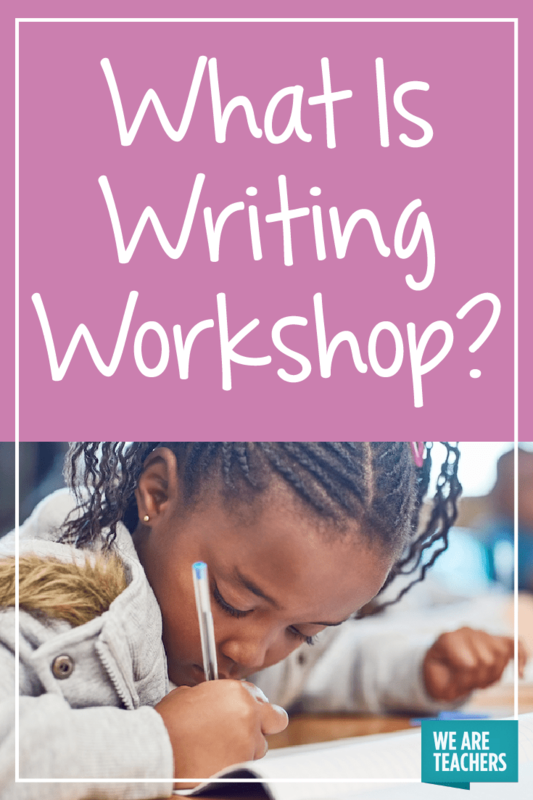 The writing workshop framework meets these needs and streamlines instruction in order to meet the most important objective: giving kids time to write. The workshop setting supports children in taking their writing seriously and viewing themselves as writers. The four main components of writing workshop are the mini-lesson, status of the class, writing/conferring time, and sharing. There is not a prescribed time limit for each component, rather they are meant to be flexible and determined by students’ needs on any given day. Sources for mini-lessons can come from many places. Many teachers follow the scope and sequence of a prepared curriculum or use the state or national standards as a guide. 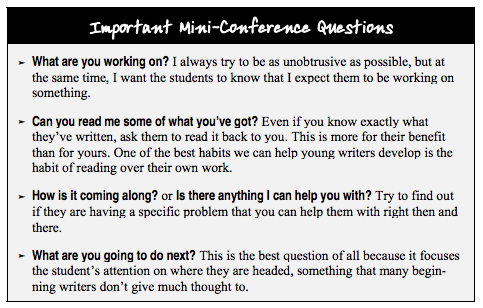 Ideally, topics for mini-lessons come from your observations as you conference with your students and become aware of their needs. Link (helping students figure out how the topic pertains to their individual writing piece). For a helpful description of the mini-lesson process, read Writing Workshop Fundamentals by Two Writing Teachers. Meant to be a quick check-in, status update is a way to find out where your students are in the writing process—pre-writing, drafting, revising, editing, evaluating, or publishing. Status of the class doesn’t have to happen every day and it needn’t take up much class time. It can be a quick verbal check-in or “whip” around the classroom. 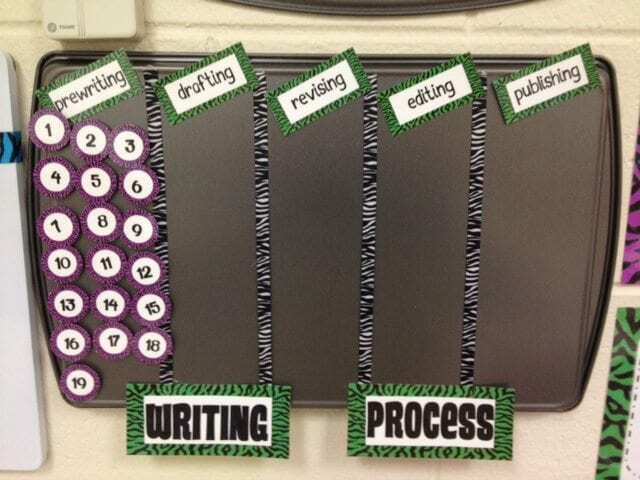 Or you may want to use a clip chart, notebook, or a magnet chart. 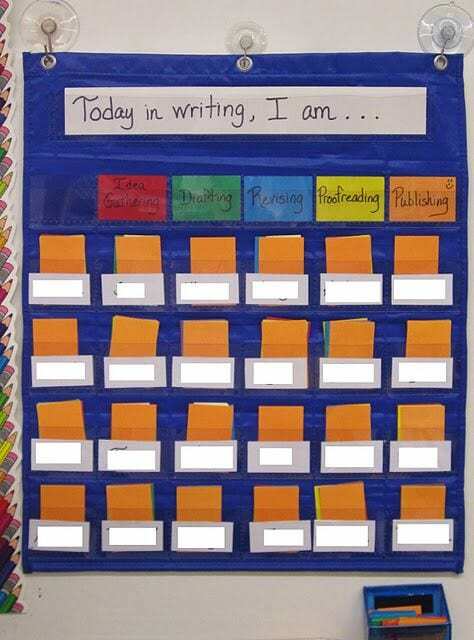 Another great idea is to use a pocket chart. Students show which step they are on by putting the appropriately colored card in their pocket. Status update lets you as the teacher evaluate how your students are progressing. It also creates accountability for the students and motivates your community of learners. The majority of writing workshop is devoted to simply giving students time to write. During this time, teachers can either be modeling the process by working on their own writing or conferencing with individual students. In all reality, the majority of your time will be observing and helping students. A good goal during a typical week of writing workshop is to aim to work individually with every student in the class at least once. Remember, the main priority of conferencing is to listen, not to talk. But to prompt your students to share their progress with you, here are a few questions to ask from Teaching That Makes Sense. Once your students get the hang of what a helpful conference looks and feels like, they can use peer conferencing to help one another. It can be tempting, when time is running short, to skip this last element of writing workshop, but don’t! It can be the most instructionally valuable part of the class, other than the writing time itself. 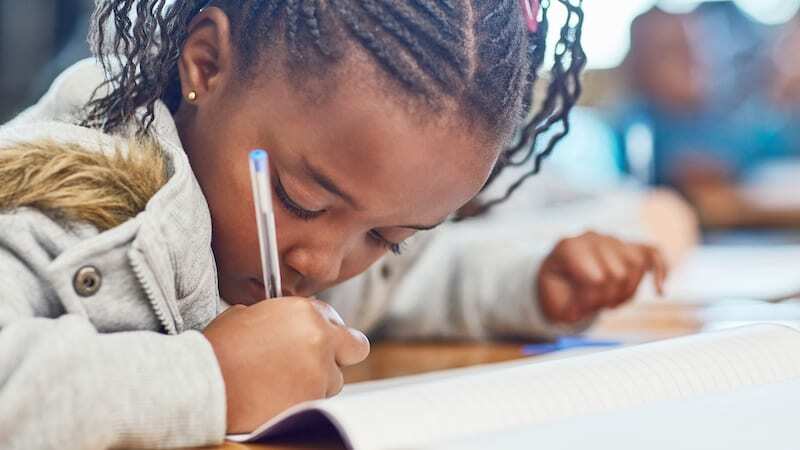 When students grow comfortable seeing themselves as part of a writing community, they are willing to take more risks and dive deeper into the process. In addition, kids often get their best ideas and are most influenced by one another. For whole-class sharing, keep a running list of who has shared and when, and have students share only a portion of their writing—maybe what they consider their best work, or a part they need help with. Let students share in pairs—one reads aloud and one listens. Have students swap work and read silently to themselves. At first the concept of writing workshop may seem overwhelming. But once you establish your routine, you’ll be surprised how easy it is to implement. Because writing workshop gives students so much time to write, their writing skills will improve dramatically. And hopefully, being part of such a dynamic writing community will instill in your students a lifelong love for writing. Got any hot tips for using writing workshop in your classroom? We’d love to hear about them in our WeAreTeachers HELPLINE group on Facebook. Plus, check out 5 Peer Conferencing Strategies that Actually Work.